(From Goodreads) Nothing can break the bond between sisters …When Beatrice gets a frantic call in the middle of Sunday lunch to say that her younger sister, Tess, is missing, she boards the first flight home to London. But as she learns about the circumstances surrounding her sister’s disappearance, she is stunned to discover how little she actually knows of her sister’s life – and unprepared for the terrifying truths she must now face. The police, Beatrice’s fiancé and even their mother accept they have lost Tess but Beatrice refuses to give up on her. So she embarks on a dangerous journey to discover the truth, no matter the cost. A gripping plot, and compelling well-written story takes place in London, when Beatrice receives phone call that her younger sister has gone missing. The story touches on many elements of medicine and crime – but the most interesting is the description of the two sister’s bond that is clearly seen throughout the story. 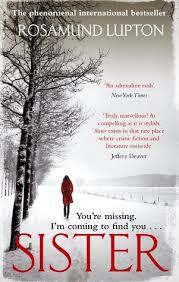 It is heart wrenchingly sad at some moments, and Lupton pulls at the emotion and psychological strings of the reader. One of the higlights of the book is, Beatrice is writing a letter to her sister, and the use of second-person personal pronoun, ‘you’, links the reader to the story, as if we take the place of the sister, – making it as if you are part of the story.